This is an English surname but one which probably has some French antecedents. Recorded in the spellings of Humble, Humbles, Humbell, Homble, and possible others, there are two known origins. The first is that it may be a nickname for a religious person, somebody who in their normal life was considered to be rather humble, although given the very robust and Chuacerian humour of the Medieval Period, the probable meaning was anything but humble! 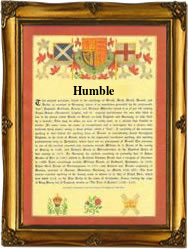 The derivation is from an Old French word 'humble' introduced into the British Isles after the Norman Conquest of 1066. It is said that the surname from this source is found mainly in the county of Northumberland, not an area known for shrinking violets. The second possible origin is locational from the manor of West Humble, in the parish of Mickleham, Surrey, and for southern born nameholders this is likely to have been the source. Early recordings include William Humble, who married Elizabeth Hope in London on June 1st 1529, whilst Humfrey Humble, the son of William Humble, was christened at St. Mary Woolnoth, city of London, on February 1541. Jane Humble, who sailed from Liverpool to New York aboard the ship "Ashburton" on June 22nd 1846, may have been of Irish birth. The first recorded spelling of the family name is that of William de Humbill. This was dated 1327, in the Subsidy Rolls of Worcestershire. Throughout the centuries, surnames in every country have continued to "develop" often leading to astonishing variants of the original spelling.